Legendary Neumann Sound on a Limited Budget! It's not just for vocals -- the versatile Neumann TLM 103 studio microphone will let your voiceovers, guitars, and other acoustic instruments shine with "that Neumann sound" which draws audio professionals to the brand time and time again. The affordable TLM 103 is a large-diaphragm cardioid microphone featuring a transformerless circuit, low noise, high sound pressure level (SPL) handling, and a capsule based on the company's classic, significantly more expensive U87 capsule. This large-diaphragm condenser mic will do the job for a range of applications, from home recording to professional broadcasting and commercial recording studio use. The TLM 103 boasts a large-diaphragm capsule with a universal cardioid pattern that draws in sound at the front of the microphone and rejects sound from the rear. When capturing vocals, recording instruments like the acoustic guitar, doing interviews, and so forth, a cardioid mic is often the way to go. 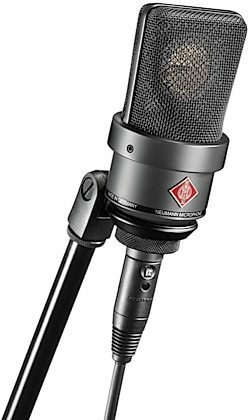 With this Neumann microphone, off-axis sounds are rendered naturally while isolation is increased. Its K 103 large-diaphragm capsule, based on the K 87 from the company's U 67 and U 87 microphones, has a flat frequency response up to about 4 kHz, and above that, a wide 4 dB presence boost. So that you know it's a Neumann, the TLM 103 is addressed from the front and is marked with the red Neumann logo on the body of the microphone. The microphone keeps plosives, pops, and other unwanted noises in check, thanks to its large wire mesh headgrille, which protects the capsule. You can use a pop filter with the TLM 103 if you want, but you may not really need it unless you are exceptionally spitty when you sing or speak. To further prevent noise from interfering with the mic's performance, the TLM 103's entire internal construction is elastically mounted. What's more, the capsule is set on an elastic mount. 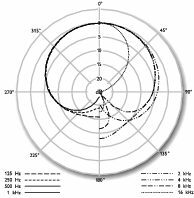 Since its frequency range actually reaches below 20 Hz, the lowest of low bass signals are reproduced without coloration. It's because of this low frequency extension that the TLM 103 is more sensitive to structure-borne interference and wind noise. This mic features a very low self-noise level (7 dB-A / 17.5 dB CCIR), making it possible for even the smallest signals to be reproduced basically noise-free. Able to handle SPL up to 138 dB without distortion, the TLM 103 boasts a dynamic range of 131 dB, according to DIN/IEC 651. There's a reason why the microphone is called a TLM -- its name is short for "transformerless microphone." Transformerless means that the microphone's usual output transformer is replaced by an electronic circuit. Neumann notes that as with traditional transformers, TLM technology ensures good common mode rejection and prevents RF interference that may influence the balanced audio signal. All in all, the TLM 103 offers highly detailed, accurate sound and superior impulse response, allowing it to reproduce your music and vocals without any noticeable coloration. zZounds is an authorized dealer of Neumann products. 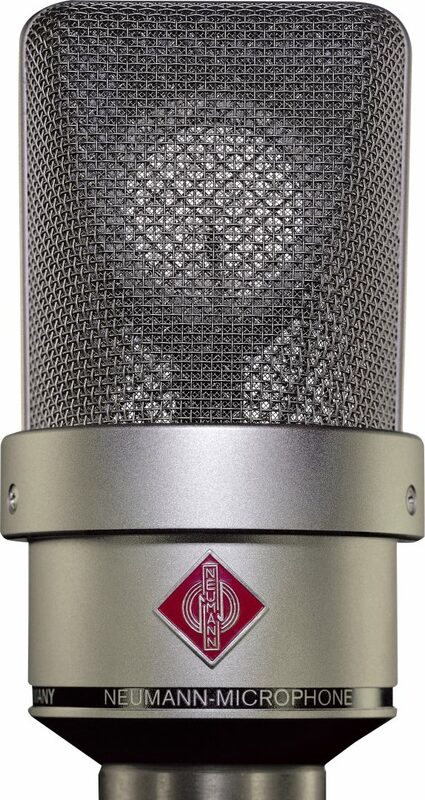 The TLM 103 is addressed from the front, marked with the red Neumann logo on the microphone body. The K 103 large diaphragm capsule is based on the K 87, well known from the U 67 / U 87 microphones. The capsule has a flat frequency response up to about 5 kHz, and above that, a wide flat 4 dB presence boost. The large wire mesh headgrille protects the capsule from plosive sounds and effectively prevents pop noises. These characteristics are achieved without resorting to corrective resonance effects. Therefore, the microphone maintains an excellent impulse response and reproduces the finest details of music and speech without coloration. With just 7 dB-A / 17.5 dB CCIR the self-noise level of the TLM 103 is so reduced that even the smallest signals are reproduced basically noise-free. As it is capable of handling sound pressure levels up to 138 dB without distortion, the TLM 103 provides a dynamic range of 131 dB, according to DIN/IEC 651. The letters TLM stand for "transformerless microphone." With TLM technology the usual output transformer is replaced by an electronic circuit. As with traditional transformers, it ensures good common mode rejection, and prevents RF interference that may influence the balanced audio signal. The entire internal construction is elastically mounted to attenuate any structure borne noise that could interfere with the TLM 103's operation. Furthermore the capsule is set on an elastic mount. The frequency range reaches below 20 Hz; thus, even very low bass signals are reproduced without coloration. Due to this low frequency extension, the TLM 103 is more sensitive to structure borne interference and wind noise. For such cases, the WS 87 windscreen is available as an accessory. For close vocal use, the PS 10 or PS 20 pop screens are recommended. "Lives up to the reputation!" Sound: I have several other microphones that I've been working with for voiceover and podcast work, an RE20, MXL990 and a Rode NT1-A. It's like someone saying, "my brand is just as good as Neumann". They aren't, nor should the other mics be considered in the same class, and now I know why first hand. Since I can't afford the $3,000 mics, this "low end" mic was the next step in the evolution of mic purchases. Right after hooking it up and placing the headphones on, I could tell there was a huge difference right away. I've heard some reviewers say that this mic is very sensitive. My impression was that it was sensitive but extremely quiet. I didn't get all the background noise that I expected to hear. It was extremely clean and pleasant. Reproduction was incredible. This is a mic that you should target if its in your budget. Feature: Plug and play. No other features present and not really needed. Ease of Use: Again, plug and play. Quality: You just know that this is a mic set apart from the others, from the wood case to the weight of the mic compared to others. It exudes quality by look and feel, even before you start using it. Value: For a home studio, don't bother wasting your time with anything else. If you want a true recording instrument, this is it! Overall: This is going to be my primary VO microphone for many years to come. If I should decide to upgrade further, I have no doubt that I can get the majority of my money back out of it. Overall: I bought the matched pair just before Christmas and have used them recording concerts for the last 6 months. I hae recorded school bands and orchestras as well as semi-pro orchestras in the area. The sound is great for instrumentals, vocals, percussion, etc., bringing warm and rich sounds for all. The thresholds are great with very little distortion. Definately a good addition to any recording equipment assortment.